SensIt performs sensitivity analysis on your worksheet what-if model and creates simple plots, spider charts, and tornado charts. SensIt creates tornado charts for both one-way and two-way sensitivity analysis. In a decision situation, sensitivity analysis helps you determine which of your input assumptions are critical so that you know where to focus your effort for gathering more information or reducing uncertainty. You can purchase SensIt risk-free with our 30-day Money-Back Guarantee. By clicking the Buy button below, you acknowledge that you have read and agree to the terms and conditions of the License Agreement. Save time by using SensIt to automate your what-if sensitivity analysis. Two ways to run SensIt: quick launch for temporary use, or permanent installation. Identify which of your model’s input assumptions are critical. Use SensIt spider charts to identify nonlinear relationships. Decide which inputs require probability distributions for subsequent Monte Carlo simulation using SimVoi. Use SensIt’s tables and charts to explain your analysis to clients and colleagues. for a tornado or spider chart, press Option+Command+s (Mac Excel 2011) or Control+Shift+S (Excel 2010 – 2013 – 2016). 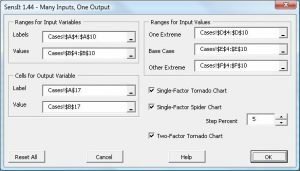 SensIt performs single-factor and two-factor sensitivity analysis by automatically varying the input values, tabulating the corresponding output values, and creating tornado and spider charts. For a larger version, click the image. On the secure Digital River page, specify quantity (number of licenses). The Student license is only for instructional use by students and instructors, and the Student add-in software may not be used for commercial purposes. The add-in software creates Student watermarks on the screen displays, worksheet results, and printout headers-and-footers.